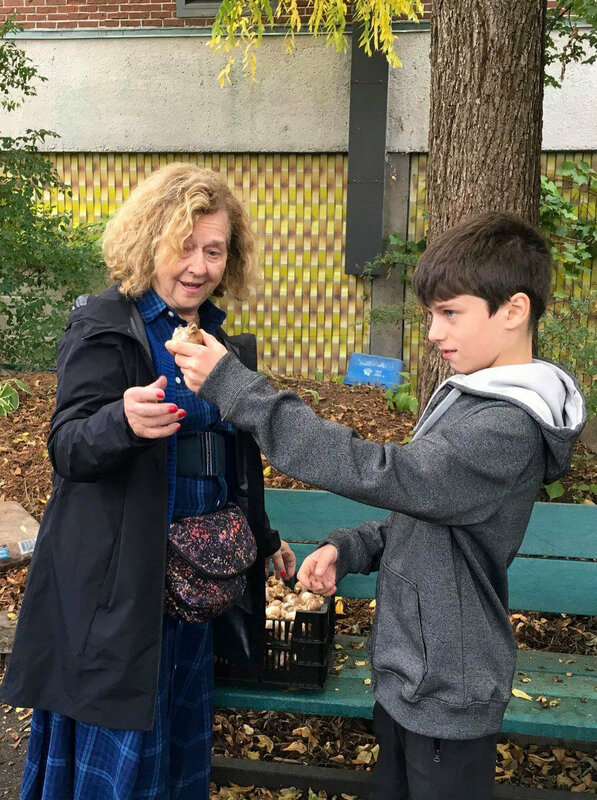 On October 15, 2018, Gannaiden: Garden of Possibilities launched a sculpture-related garden initiative in collaboration with l’École secondaire de la Cité-des-Jeunes. The garden, entitled ‘le jardin pour tous’ is located in the central courtyard of the school. Through student participation the project aspires to revitalize and socialize this highly visible green space that has been abandoned to neglect. 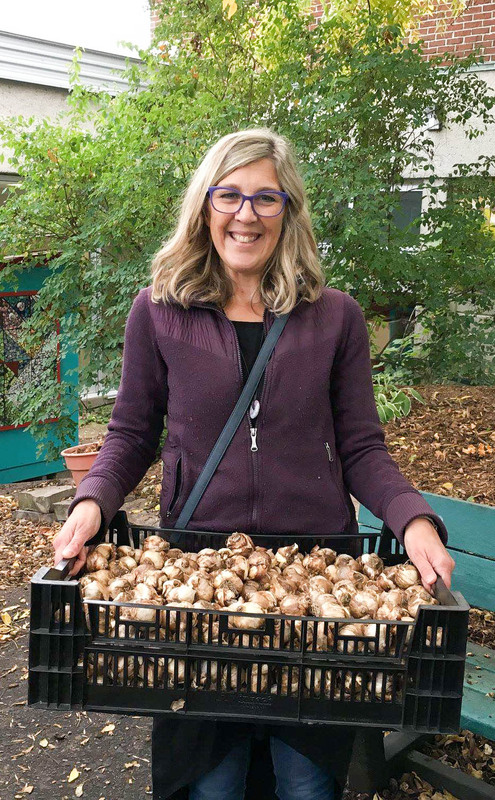 To kick-off the initiative, Gannaiden’s own gardener Elaine Steinberg paid a visit to the Everest group of secondary students with 500 bright yellow daffodil bulbs, ready to be planted in le jardin pour tous. The bulbs will bloom next spring. “Symbolically, the planting activity today is done in the hope of a brighter future” said Steinberg. Next spring, as part of the visual arts course and accompanied by their teacher Nancy Lépine, the students will visit artist Marcel Braitstein in his studio and sculpture-garden at Gannaiden Garden to learn of his history and source of inspiration. 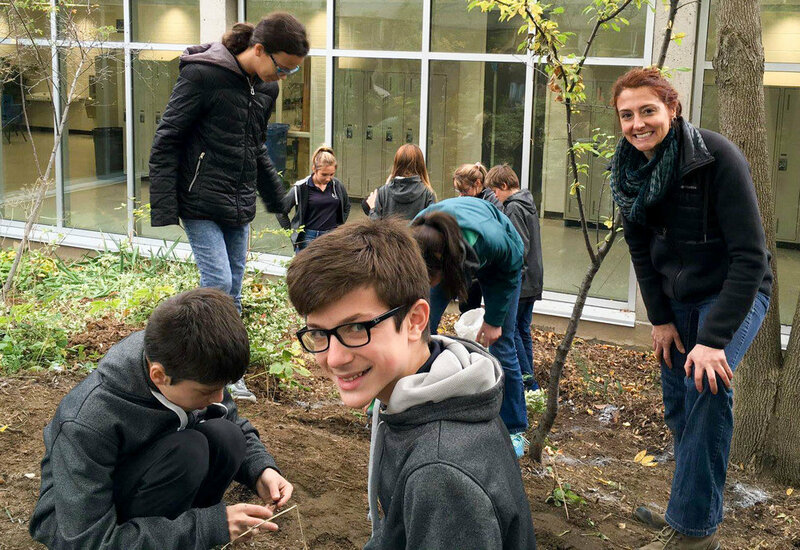 Subsequently, led by mosaic artist Monica Brinkman, students will realize a collective installation of sculptural elements in le jardin pour tous at their school. This collaboration is an opportunity for Gannaiden’s couple, Elaine Steinberg and Marcel Braitstein to celebrate with a wide-eyed generation of aspiring artists their love of sculpture and gardens as social spaces. Special thanks to the Council of Arts and Culture of Vaudreuil-Soulanges for believing in this project and partnering in the financing of it. Special thanks also to the high-energy team of Nancy Lépine, specialist in visual arts, Monica Brinkman, mosaic artist and Katryne Delisle, horticulturalist with the Ville de Vaudreuil-Dorion.